This February, amid the ongoing debate about whether college athletes should be paid, the University of Iowa’s Athletic Director Gary Barta went on TV and said he wasn’t in favor of paying athletes because doing so would be too complicated. Barta appeared on a local talk show and spoke at length about the effects markets have on coach pay, and said that a system for paying student-athletes was out of the question. “I’ll probably choose to do something else for a living if we ever had to go that route, because it’s so complex,” he said. Iowa’s student-athletes were part of an athletic department that helped the university make almost $100 million in sports revenue last year. Commentators have pointed to racism, greed and tradition as three reasons that college athletes aren’t paid. But Barta’s anti-pay comments got at another issue: logistics. To pay a college athlete fairly, a school first needs to figure out how much he or she is worth. That’s a fraught calculation, but not an impossible one. Let’s use college football quarterbacks as our case study. With the advent of advanced analytics and public disclosures about universities’ athletic department income, we can begin to approximate what each quarterback is worth to his university. Heisman Trophy-winner Jameis Winston of Florida State University, for example, is worth an estimated $3 million more than the average college quarterback. 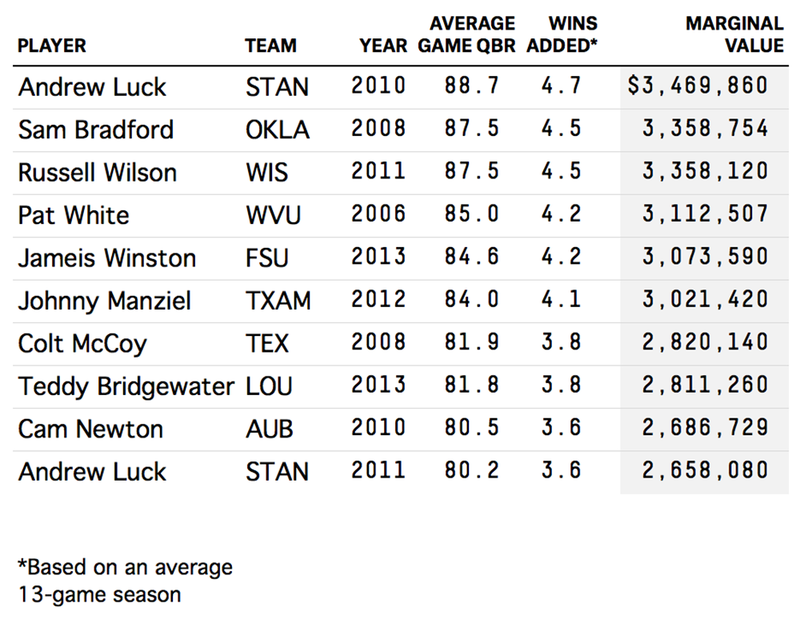 In his time at Stanford University, Andrew Luck was worth even more. We arrived at those calculations after building a model that relied on nine seasons of data on 6,884 football games from the BCS conferences and eight years of school financial data.1 Armed with those stats, we were able to identify the quarterbacks who generated the most revenue in college football over the last several years. 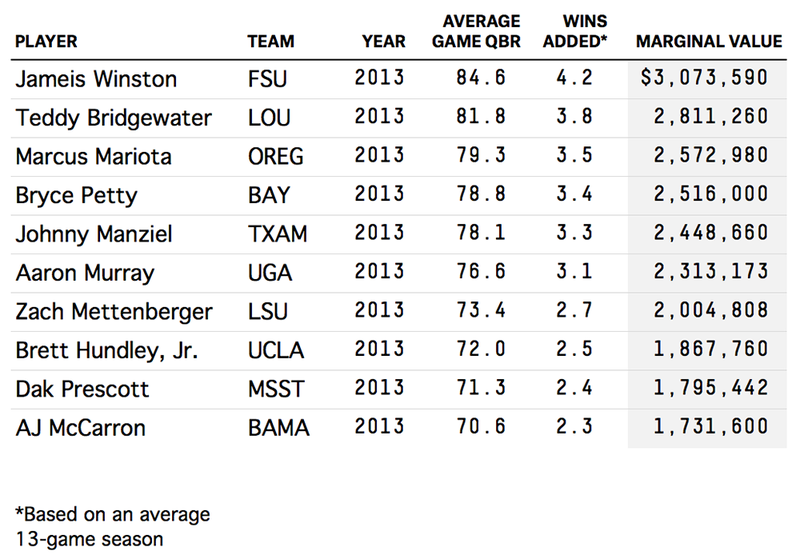 First we quantified how much each quarterback helped his team win. That’s something that’s done in plenty of other sports. FanGraphs calculates a statistic called wins above replacement (WAR) in baseball using fielding, hitting and baserunning statistics for position players. In basketball, Wages of Wins creates an analogous statistic called Wins Produced based on a number of player statistics, including field goals made, missed shots, rebounds and blocked shots. Measuring player value is harder to do in football than it is in other sports because multiple players are involved in every play. So we used ESPN’s Total Quarterback Rating (QBR),2 which factors in clutch play, ability to avoid sacks, and yards after the catch by the receiver, among other things. The first step of our analysis used a “school-fixed effects” win-probability model to isolate how each quarterback affected his team’s winning percentage. We controlled for opponent quality, home field advantage and “school-fixed effects,” because a star quarterback at a football powerhouse like the University of Florida will win more games than one at Baylor University, all other things being equal. For instance, Heisman Trophy-winners Tim Tebow and Robert Griffin III started a similar number of games and had similar average career QBRs, but Tebow won 11 more of the games he started because his team was better than Griffin’s. Calculating a quarterback’s win share was the easy part; calculating his economic value is more difficult. Using eight years of BCS schools’ financial data, we estimated the increase in revenue from an additional win.4 We controlled for a school’s average inflation-adjusted football revenue5 so that we could see the differences among schools with similar winning percentages. For example, the University of Texas averaged more than three times the annual football revenue over the period, likely due to its larger market size and more storied football tradition. We also controlled for variables within a season that might also have had an impact on revenues, such as year, the number of home games, change in conference affiliation, and local economic conditions like the home state’s unemployment rate. A truly elite college quarterback can add more than four wins and over $3 million to his school’s annual football revenue, as we saw in the table above. Andrew Luck’s career at Stanford is a good case study. In 2008, Luck’s predecessor, Tavita Pritchard, averaged a QBR of just 47.0 (slightly below our sample’s mean QBR of 52.6) and the Cardinal had a 5-7 record. Our model estimated that, based on his QBR, Luck added roughly two, 4.5 and 3.5 wins in his first,7 second8 and third9 seasons. So Luck earned $2.5 million in additional revenue per season over what an average quarterback’s performance would have brought in. During Luck’s three-year tenure, actual Stanford football revenues averaged $2.7 million higher than in Pritchard’s last year. Other star quarterbacks such as Sam Bradford (Oklahoma) and Pat White (West Virginia) saw similar increases at their schools of close to $2 million per season. Of last season’s quarterbacks who were drafted into the NFL, Teddy Bridgewater, now of the Minnesota Vikings, was the most valuable. Winston still bested him, though. You can read the full paper here. Data for 2013 hasn’t been released yet for some schools. For 2013, we’ve estimated value using data from 2004 to 2012. Disclosure: ESPN owns FiveThirtyEight, but our research was conducted well before we had any arrangement with FiveThirtyEight. Full details of the model and results can be found in our research paper. Football program financial data was compiled using the U.S. Department of Education database. This data may underestimate football program revenue — athletic department financial statements often include revenue “not allocable by sport” (which we did not include in our primary results) that is potentially attributable to success on the gridiron. This estimate includes whatever expected boost current-season performance might have on the following year’s revenues. In Luck’s first season as starting quarterback in 2009, his average QBR was 71 and he led Stanford to an 8-4 regular season. In his second season, Luck averaged an astonishing 89 QBR and the Cardinal went 12-1. In his final year before turning pro, Luck’s team went 11-2; his average QBR that season was 80. Seth Gitter is an associate professor of economics at Towson University.